If your dishwasher is leaving a white, chalky film all over your dishes, there are steps you can take to never have to deal with this frustrating problem again. Some people will try using a rinse aid product that promises to leave dishes sparkling clean only to find the results don’t last long. There could be a number of things going on that causes a white film on your dishes. The dishwasher has never been cleaned. Scale coating originates from the hot water heater tank. Poor quality soap that leaves a film. Hard water contains calcium and magnesium or other elements which are responsible for creating a white film on dishes. This chalky film is more commonly referred to as scale. A water softener will permanently resolve the problem of white film on dishes and everything else hard water touches. But there are other steps that often need to be taken before expecting the problem to go away for good. The hot water heater tank heats the sediments in the water, turning them into a sticky coating that eventually forms into rock-hard clogs in your pipes. To avoid this from happening and to ensure your dishwasher cleans the dishes right, have a local Tampa plumber flush out and clean the hot water heater tank. The plumber should remove any buildup within the bottom of the tank, clean up parts that need it, and flush out the flaky scale floating in the water. The old adage, “You get what you pay for” is true when choosing a dishwasher soap. Some will leave soap residue all over the dishes even if the home was just built brand-new. Choose one that works as it should and you’ll know it’s not the soap causing a chalky film on your dishes. Do you have low water pressure when trying to use the shower or sink for hot water? This issue is likely due to scale buildup within the hot water supply lines. 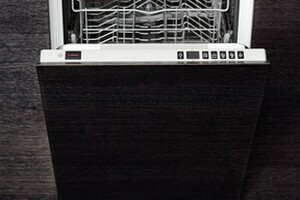 If this is a problem, you will notice low water pressure and white film on the dishes from the dishwasher. Cleaning out the hot water heater tank and installing a water softener won’t be enough to keep white film off the dishes permanently because the water supply will continually be flowing through a hardened scale buildup. This problem will have to be handled by a licensed plumber who will advise you of what method will work best for your specific situation. You may need the pipes flushed or replaced. For more plumbing tips or help with your dishwasher, water heater, or pipes, call 1st Choice Plumbing Solutions at 813-643-7556 or fill out our online request form.